Our heads jerked in unison towards the moving source of the panic. Loud gruff screams ripped through the din of the fish market just as the fishmongers were packing up their stalls for their afternoon siesta. The chase was on. A bluish white blur of movement could be spotted at the middle, at the far end, in the distance, now gone. A fisherman was running for all it was worth, chased by a burly guard who was fast, but not fast enough. The nimble fisherman bounded across the road, leapt over the barricade and vanished in a flash. The guard, glossy with sweat and fuming with anger, stormed back in the direction of the municipality office. Another fisherman flouting the market regulations had gotten away. Seconds laster, all heads dipped back into their own individual stalls, back into the chaotically synchronized din of the market. Nothing out of the ordinary had happened at all. I challenge you to be bored at the fish and vegetable market. It simply isn’t possible. You might leave with smelly hair, clothes splattered with dirty water stains and a pounding head after a chatty fishmonger points out that the prized ‘snapper’ you just haggled over three stalls away is a rubbish fish that he wouldn’t even feed his cat. But bored you will never be. My goal of visiting the market that afternoon was to identify a fish from the “green sustainable list” and hand it over to the Egyptian grill masters in the market to cook it up for me. 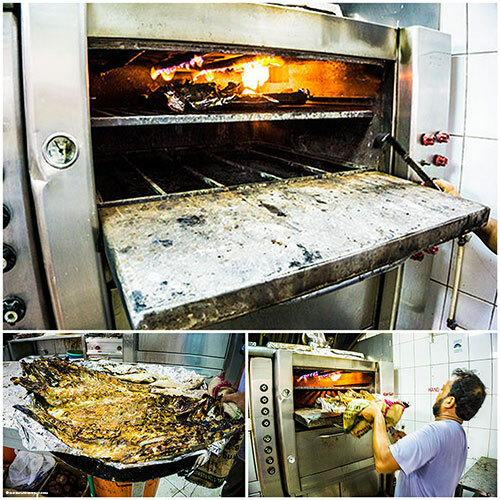 The ten-year old "Grill and Shark" Restaurant in the small Al Ras complex next door to the market offers a brilliant way to expand your fish horizons by taking your bag of raw and unfamiliar seafood and grilling it up within an hour so you can get a first-hand taste of the fish before investing in a freezer full of it. Obviously, don't be persuaded by the 'Shark' in their name to go down the unsustainable route – there are a ton of better options out there so try to educate yourself. 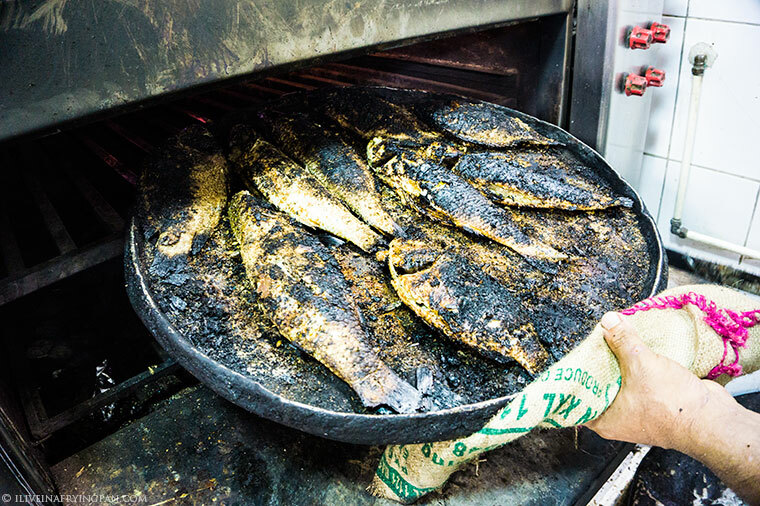 Venture beyond the unsustainable favourites like hammour and kingfish (canaad) and let them show you how to grill up otherwise unfamiliar fish on the green sustainable choice list at www.choosewisely.ae. Incidentally, afternoon is the worst possible time you can visit the market. All the fishmongers are swooshing their tables clean, and other than a few traders desperately trying to lob their wire baskets of tuna into your hands, you get nothing but the tail end of the catch. 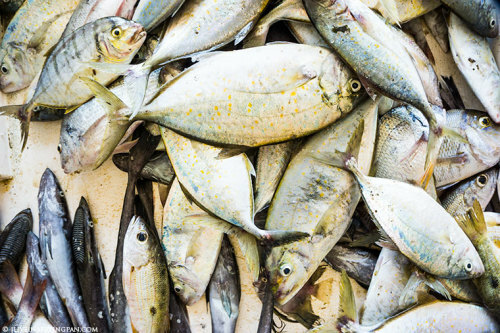 I ploughed through the empty market, determined to find 'Jesh' (orange-spotted Trevally) amidst the sea of leftover tuna, and finally found myself pushed in front of a wheel barrow of supposedly ''still alive'' fish. They looked dead as dead could be. As I spoke to Gulzar who was manning the barrow, a golden streak jerked out of the corner of my eye. A two-bar seabream, Faskar, was still writhing with life. The fish were just caught, I had lucked out even when the market was closing for siesta. I bagged the fish for a barely-negotiated ten dirhams and raced in the direction of the Egyptians. On the way there, I met Gul Sher, another fishmonger who'd been introduced to me by the lovely Mishti at www.stovetopdancing.blogspot.com. Gul Sher has a heart of gold. He graciously slipped in two Omani tiger prawns into my twitching bag and refused to look back at me as I begged him for the price. In the one hour and all of five dirhams that it took the Egyptians to fire up my fish and prawns, I walked around the market, repaid Gul Sher with a golden Sri Lankan coconut brimming with sweet water, and sank down on a bench with him to share stories about the market, my life, Dubai, the world. Little conversations with the people who feed you are some of the most fulfilling conversations you can have. The Egyptians had baked my Faskar in a salty coat of tomato, onions and garlic. Their ovens smelled incredible. I just stood there gaping as they pulled some sort of massive butterflied fish out of the fire, the aroma of sweet baked garlic making me dance with joy and making them laugh as they watched a girl dance over the smell of garlic. I paid the Keralites next door five dirhams to use their dining space. 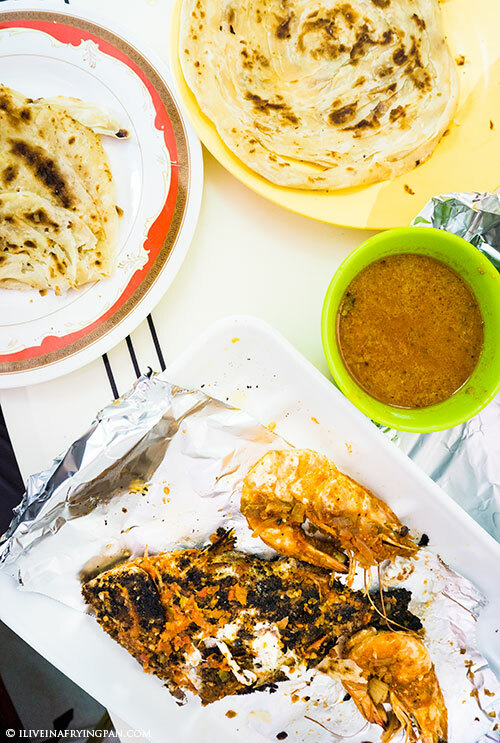 They chivalrously cleared the men off a table for me, sat me down with plates and tissues, offered me a choice of parottas fried in the morning or fresh tandoori bread, and some coconut curry to pair with the fish. Another three dirhams for the curry and parottas. The innards of the Faskar were coarse and meaty, the meat to bone-ratio on the size I had bought was perfect. The best way to eat the fish would be to scoop up the seasoning on the skin and combine it with the white flesh, the seasoning being too salty on its own and the flesh being too bland on its own. This is the sort of fish that would do best with being butterflied, coated on the inside with lemon and seasonings, re-sealed and then baked. A squeeze of lemon or malt vinegar would also make the fish speak volumes louder on flavour. If I were to take this fish home the next time, I know exactly what I would do with it. Or even if I were to ask the Egyptians to prepare it for me again, I'd be really specific about how I'd like it prepared. This is the beauty of doing a new fish experiment with them – taste, strategize and then hit the flavour target on the next go. 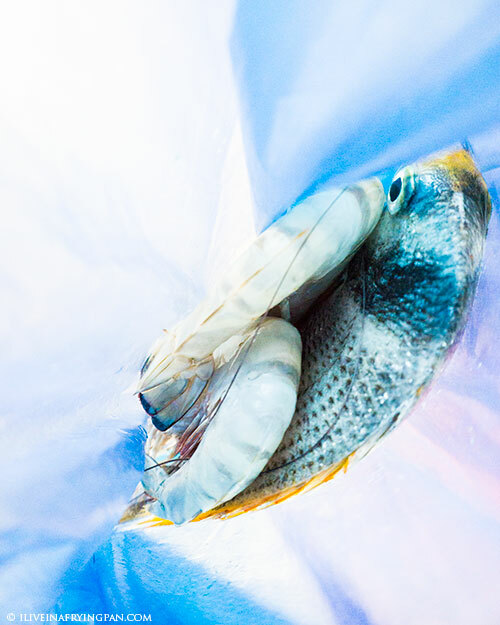 The lure of fresh-caught seafood for lunch is so powerful that it can isolate you on your own momentary island of culinary reverie. 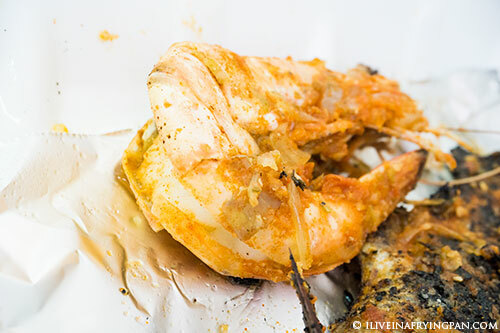 I was done with lunch before I could even process the thought of squeezing lemon over my fat pink tiger prawns, each of which I generously dunked in the Keralite coconut gravy with stellar results. A simple butter, garlic and sea salt garnish would have also done those prawns great justice. A good thought for my next visit. Lunch was heavy, but strangely not the kind that would be a reason to skip dinner. Yet, something about the experience of buying the live fish, chatting with the fishmongers, absorbing the smells and screams at the market, sitting around in a bachelor haunt to have my fresh-baked fish with butter-laden parottas, it was such an immersive experience that I stayed full for the entire day. My heart and mind had absorbed so much in two hours, that they closed themselves off to any another experience that evening. My next pick for a fishy experiment will be Jesh or Anfooz (Yellow Bar Angelfish), whichever one I find jumping about in Gulzar's wheelbarrow next week. 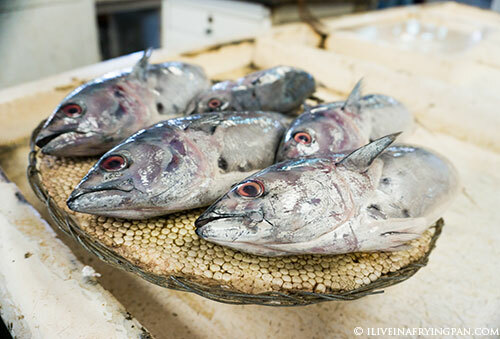 If you like seafood, then you've simply got to go to the market and experiment your way around too. Don't tell me that Buqtair is more convenient and their fish is the bomb, I was once part of their fan following too. But now, I'd rather skip the overpriced and deep-fried hammour and shaari (both options are unsustainable) at the beach shack and go fish for more sustainable options at the Deira market. 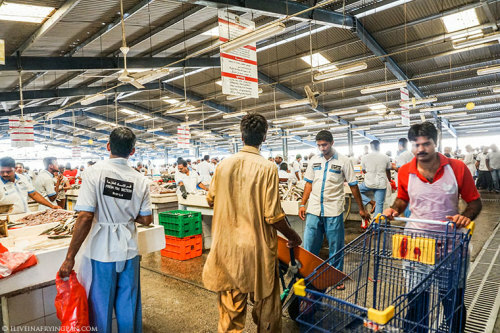 For high quality fish: Gulzar (left of photo below) – 050-694-1469. Walk outside of the market, between the fish market and the mosque to your right. Take a left at the end of the market, and walk down the side. Gulzar's stall is one of the stalls lining the perimeter on the far end of the market, about two stalls before you end up stepping into the utensils and veggies section. 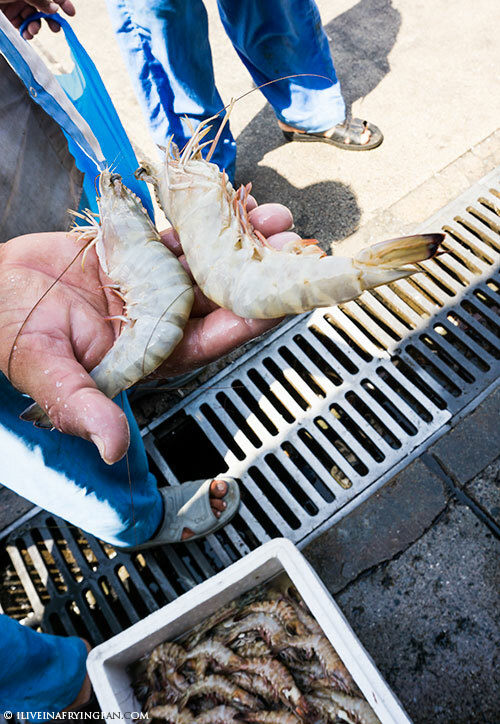 For wild and farmed Omani prawns: Gul Sher (right of photo below) - 055-120-4200. His stall directly faces them mosque to the right of the market. ← Older: Hotpot haunt in Nasr Square, Deira that’s totally worth the hunt. Oh Arva! This is an exceptional experience and even though we often visit the fish market when we are there I did not know one could get the catch grilled right next door. Amazing … and only in Dubai! Amazing write up….good job. I love fish but cleaning and gutting it is one thing I detest. This option sounds charming :). Thank you Judith! Not a fan of the cleaning process either, that’s why I like the lazy ‘from raw to cooked’ option in the market – instant gratification! Brilliant! Is this a part of your tour Sizzler? 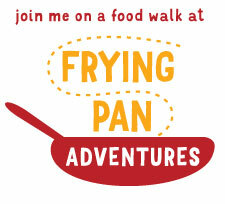 @Sally – I hope this week’s session helped kickstart the fishy learning process! I’ve realized after two trips – ideally spaced no more than a week apart – you really start getting a feel of the place. Got to keep going there, you can fish new tidbits of info during every visit. Thank you Lara :) glad this revived memories. Fish and prawns with tabbouleh sounds amazing. Family meals are always the most memorable. Do you recall what was the price for a coconut? These are quite pricey in stores. Thanks in advance! 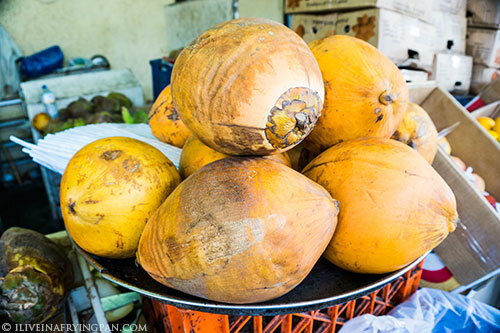 Makushimu – The price is AED 4.00 for an Omani (Salalah) coconut, and AED 5.00 for a Sri Lankan King coconut. Both are rich in sweet water, and if you’re lucky, you’ll get one with a layer of coconut cream tucked inside. The prices charged for coconuts across the rest of the city are pure highway robbery. Is this Grill and Shark Restaurant still there? Hi there Harvey, yes it is!